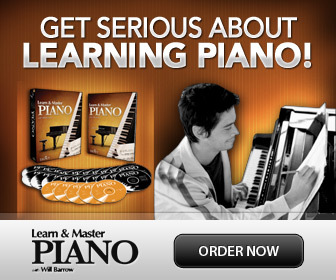 Here you will learn about interesting and useful piano scale patterns that are not major or minor, and how to easily find them on the piano keyboard. Best of all? No note reading required! Here are 5 non-diatonic piano scale patterns that can be found easily on a piano keyboard. Spice up your playing by checking out and learning these easy picture scales! It doesn't matter where you begin actually. Any of the black keys can be used as the "root" or tonal "center". Sometimes you will hear that a pentatonic scale sounds in "major" or "minor". This depends on the color it gets from where the largest interval (1 1/2 steps) is positioned. For example, starting on C# as above, the largest interval is between the 2nd and 3rd key. This is called "Major" pentatonic. If you instead start the scale on Eb, the largest interval will be between this 1st key and the second. This is called a "minor" pentatonic. Even though the pentatonic scale pattern is easiest to see on the black keys, doesn't mean it has to be played there! Every scale can be moved (transposed) to any key on the piano, you just have to keep the same pattern of steps. The name is from Greek [Chroma] which means "color". This refers to the chromatic changes of a note- a half step up or down etc, which was/is often used for embellishments or decoration of a melody- that's what the word "color" stands for! The scale consists only of half steps, and gives you no sense of tonality, because the notes are exactly evenly apart. So it doesn't really matter from what note you start or end the chromatic scale. You guessed it- it consists of only whole tones/steps! This scale has an almost "otherworldly" sound. It was used by Claude Debussy for ex. in “La Mer” for a beautiful flowing sound in the style of "Impressionism". Again- since the notes are constantly a whole step or tone apart there is no sense of center or tonality, which gives it a freer and more open sound than major and minor. Even though it is basically a minor pentatonic scale, the blues scale pattern consists of 6 different pitches, and uses both half, whole and 1 ½ steps. The blues scale used for piano is a modification of the original blues scale (which use intervals smaller than half steps), to at least try to imitate the "blue" notes, or "bent" pitches of the blues, but still be able to play it on the piano. This scale pattern was introduced by the Austrian composer Arnold Schoenberg in the early 20th century as a way to break away from the traditional sounds of major, minor and modal patterns. A way to explore the borders of tonality- and atonality; by avoiding any association with tonality at all! Twelve tone music is also called serialism, since it is made up of an organized row, or series, of the 12 chromatic tones. This series has then to be repeated in specific ways. All association with major and minor is in this way avoided, for a more "dissonant" sound color. This type of "scale" is not common at all, but fun to know about! Remember- Any piano scale pattern can start from whatever note you want! You just need to make sure to follow the exact pattern of whole and half steps, or more, for that particular mode- and there it is in a new key- transposed!